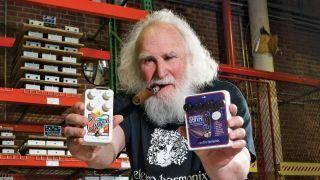 We talk about effects units old and new with Electro-Harmonix’s charismatic founder. “The first pedal that I built under Electro-Harmonix was in late 1968 and it was the LPB-1 Linear Power Booster. I hooked up with a guy from Bell Labs who was working on a distortion-free sustainer, and when I went to check out the prototype I saw a little box plugged into the front of the amp. 2. What’s your best-selling pedal and why do you think that is? “In terms of combined total units, it’s the Big Muff [variants], but our biggest single seller at the moment is the Canyon. 3. What makes Electro-Harmonix effects unique? 4. Which notable players/bands have used Electro-Harmonix pedals over the years? “[Carlos] Santana bought a Big Muff from me using mail order with a Santana cheque and letterhead back in 1971! The Edge uses our Deluxe Memory Man; in fact, he just called up and got a special version - our 1,100-millisecond Memory Man [1100- TT]. Kurt Cobain used our Polychorus and Small Clone. 5. What’s new on the horizon for Electro-Harmonix effects? 6. 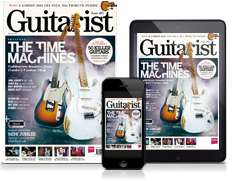 Can you share your best tone tip? 8. What’s your favourite vintage pedal and why? 9. What are your favourite effects moments on record and why? 10. What pedal problems do you think effects designers have yet to crack?